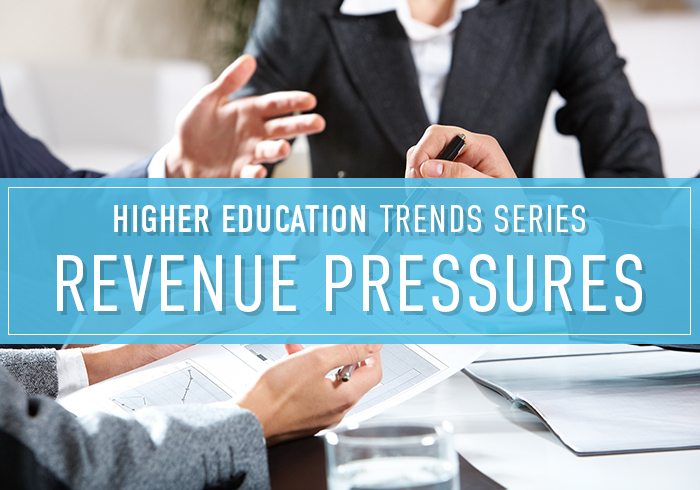 As schools face declining endowments, lower enrollment and shrinking budgets, colleges and universities look for new sources of revenue. A decade after the start of the Great Recession, colleges and universities continue to grapple with the financial fallout and find ways to lay a stronger foundation for the future. One thing is clear: moving forward, higher education will need to find solutions to supplement traditional sources of funding. Each school needs to find new revenue streams that make sense for its unique needs and community. Fortunately, there are new opportunities to relieve revenue pressures — and schools across the nation are taking action. It’s not hard to understand why so many colleges and universities are facing financial challenges. For public institutions, state funding has yet to reach pre-recession levels. In fact, as of 2017, state funding was $9 billion behind where it was in 2008 after adjusting for inflation. At the same time, to stay competitive, private institutions are awarding higher tuition discount rates than ever, reaching an estimated average of 49.9 percent for first-time, full-time freshmen in 2017-18. Essentially, private, non-profit institutions put almost half of tuition and fee revenue from these students back into institutional financial aid. The problem, however, cannot be solved by recruitment alone. In the spring of 2018, undergraduate enrollments dropped by 275,000. This is a trend tied both to financial considerations and fluctuations in the 18-to-24-year-old population, which is projected to continue until at least 2023. Of course, even if they meet enrollment goals, schools also are under significant pressure not to raise tuition. 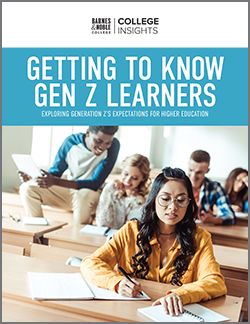 It’s a difficult situation in an environment where expenses increased at twice the rate of operating revenue between 2010 and 2015, according to Integrated Postsecondary Education Data System (IPEDS) of the National Center for Education Statistics (NCES). In response to the pressures they’re facing, colleges and universities are taking a wide range of approaches. And, while some are cutting programs and services, many are looking for opportunities to consolidate and collaborate. In Georgia, the Board of Regents has merged 18 colleges into nine new institutions since 2011. Connecticut’s 12 community colleges will be reorganized into one accredited institution, beginning in 2023. Other colleges and universities located in highly concentrated areas for higher education — like Boston and Atlanta — are pooling their resources in areas such as administrative services, campus security and shuttle buses. Strengthening student pipelines is another strategy many schools are pursuing. For transfer students, that often means revamping the recruitment and application process, as well as bolstering relationships with feeder high schools and two-year colleges. Other schools are seeking to enroll greater numbers of international students. However, with immigration policies in flux, efforts to recruit and retain this population face additional hurdles. Renting out spaces on campus — from athletic facilities to performing arts venues to hosting summer programs — also offer the opportunity not only to gain additional revenue, but to bring more students and members of the community onto campus and build awareness of the school. Some schools are getting creative, especially the smaller, private four-year colleges who must compete for students. After receiving farm property as a gift, Unity College in Maine began offering horticulture workshops and renting space in its greenhouses to local farmers. The college’s dining services division uses tomatoes grown on the farm to make ketchup and hot sauce for sale. Other traditional sources of revenue can continue to produce results, even in a post-recession world. The campus bookstore, when managed efficiently and in ways that meet the demands of today’s students, offers a wealth of opportunities. While the market for course materials continues to shift, schools can capture vital revenue by providing affordable options in a variety of formats, including digital courseware. Perhaps just as importantly, as course materials evolve and adapt to changing student needs and preferences, the campus store can support a broader retail environment. Today, schools can earn much-needed revenue from general merchandise, including branded college apparel, cafes, trade books, school supplies and convenience foods. This offers a benefit to students — a one-stop shop for the day-to-day items they need and want — in addition to generating sales. Adding a café and/or gathering spaces also helps establish the campus store as a social hub, offering places for studying and group work, meeting up with friends or events run by student organizations. 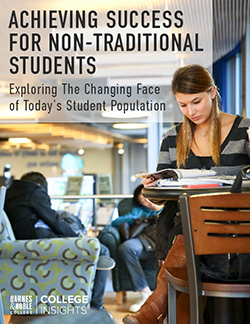 Finding the right partner to operate the campus bookstore is crucial to maximizing its potential. An experienced partner will bring retail expertise to the table, helping schools select a strategic, research-based merchandise mix that’s right for their campus communities. In addition, the partner should have a deep understanding of royalty protection and licensing agreements, ensuring that the school’s brand is used appropriately and to the financial benefit of the school. Through it all, the right partner will listen to and work closely with schools and store staff at the local level, customizing the experience to build community, promote school spirit and support students’ academic success.